8-12, as follows: 1-2 Keyboards, 1 Electric Guitar, 1 Bass Guitar, 1 Drums / Percussion, 1-2 Violins, 1 -2 Reed 1 (e.g. flute / clarinet), Reed 2 (e.g. clarinet/saxophone), Trumpet, (Trombone), (French Horn). The parenthesis is meant to indicate optionality. The ideal is somewhere between 8-12 actors with doubling; it is also possible not to double and have a small ensemble to fill out group scenes. Female chorus could range from 1 to 3 and male chorus could range from 3 to 4. The committee was struck by the strong character writing in this adaptation of the MGM film, and by the sensitivity with which the authors have expanded on its themes of mental health. We appreciate how Benny & Joon manages to deepen and update its source, even as it honors the spirit of the original. 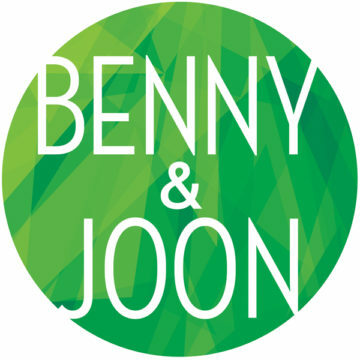 Benny & Joon first received a private developmental 29-hour reading in January, 2013 (Ripley Grier Studios, New York), followed by a two additional private developmental 29-hour readings in February and November, 2014 (Pearl Studios, New York). A private, developmental lab was held at the Transport Group in September, 2015. Further development occurred at the Running Deer Musical Theater Lab (June 2014) and at TheatreWorks Silicon Valley Writer’s Retreat (January 2016). Our artistic journey started with Nolan, who was invited to choose a title from a list of MGM movies they wanted to make into musicals; he chose Benny & Joon, drawn to its quirky characters and heart-pulling story. Mindi and Kirsten joined soon after, equally enchanted by this unique tale of a brother and a sister making their way in 1990s Spokane, Washington. The tricky thing in adapting a movie to musical theater form is what to keep and what to change from the original story details, and filling in all those wordless close-ups with songs that reveal the complicated emotions they suggest. The character of Sam, who comes into the story and changes the lives of Benny and Joon, is a movie buff—obsessed in particular with silent movies and Buster Keaton—so it has been fun finding a way to translate that cinematic impulse to theatrical life. We were very excited when Jack Cummings III agreed to become our director, as his own idiosyncratic sensibility coupled with a lightning sense of pathos and comedy, has really upped the ante for us. We’ve had a few developmental presentations and now, NAMT; what excites us most right now is the thought of seeing the show fully staged before a live audience.